Written by guest writer Ian Lee. Who doesn’t love the look of bare metal? It gives the impression of so much potential, but can also be a finish in itself. Jason Moore of Flying J Customs is one man who is able to produce a bike using bare metal highlights, and his 1976 Honda CB550 café racer is packing more aluminum than a fridge full of leftovers. 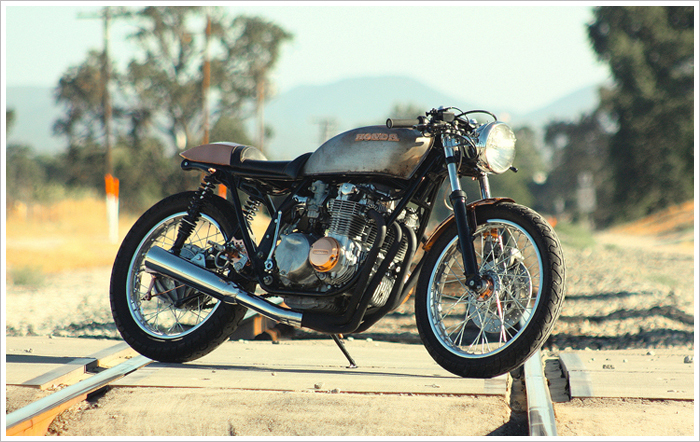 With performance to match the looks, today’s feature bike is bare metal goodness, with old school styling thrown in. Did I mention about the bare metal? The Honda CB550 is like the steak on the menu at the most pretentious restaurant you can think of – you know the one that has Salmon foam and Quail eggs cooked “three ways”. The steak is usually the banker though. The one meal you can easily pronounce and the one that is really hard to screw up. Plus, with the right cooking methods and sauces you can stamp your individuality on it. 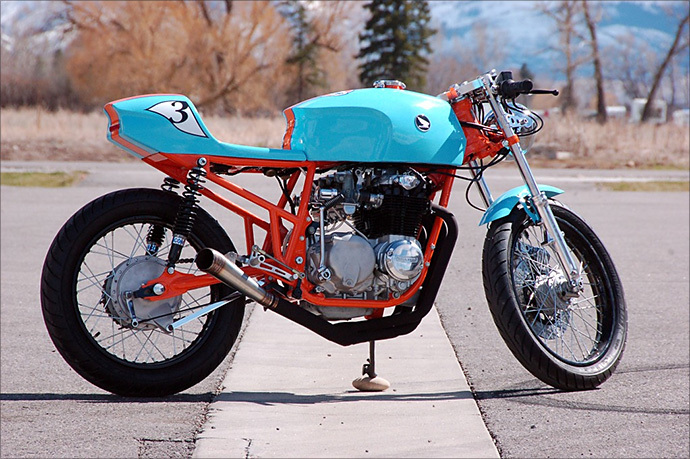 So when the Head Chef of “some new restaurant” David Jeffers wanted to buy a motorcycle, he started sourcing ebay for some prime steak… I mean some prime examples of the Honda CB550. Want to freak out a graphic designer? Make him pray to a higher power and start rocking back and forth on his fancy bent-wood chair. Then give him a job where he can only use two colours – safety orange and turquoise, and then watch him squirm. All the rules of colour theory say “no, this absolutely cannot work.” And yet behold the beauty that is the Gulf Oil livery. Is that angels I hear? Beautiful retro motor racing angels playing heavenly engine music through trumpets that look remarkably like velocity stacks? Chris Trotter from Bozeman, Montana heard that music too. 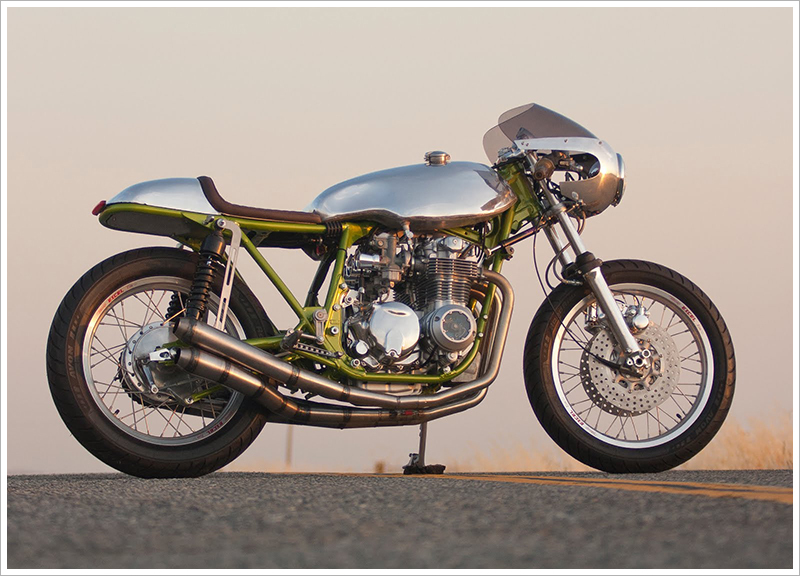 And that music said unto him “build the world’s sweetest Honda cafe racer and paint it like the world’s coolest race car, then send it over to those incredibly great guys at Pipeburn so that they may show it to the world.” And beholdeth, he did. And it was good.